Stop Religious Practice and Perching in Govt and other public places. Stop Religious Practice and Perching like Bible – Quran Distribution, Offering Namaj, Muharram-Run, Quick Sermonizing, Beef Eating, Distributions of Money or Food etc. with ulterior Religious motive in Hospitals, Schools, Colleges, Govt Offices, Railway Stations and other Public Places. Upananda Brahmachari | HENB | Vellore – Panaji – Kolkata | 17 Feb 2015:: Police arrested two persons from Gudiyatham (also called Gudiyattam or Gudiyettram, a municipality in Vellore district in the Indian state of Tamil Nadu) for Distributing Bibles in Government Hospital. These two persons were arrested for allegedly promoting Christianity in the Gudiyattam Government Hospital on Tuesday. The police arrested Radha Krishnan (65) and H Anitha (39), who are cousins and residents of Melalathur. According to police officials, “Anitha’s husband Henry Pula was a pastor in a church in Melalathur. He died 40 days ago due to a chronic disease. 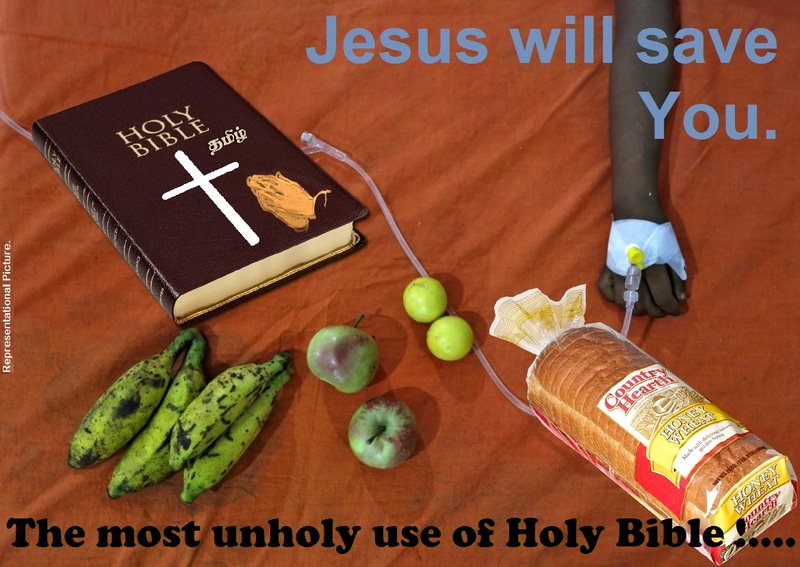 So, Anitha gave loaves of bread and bibles to 60 patients in the Government Hospital as a form of ritual in Gudiyattam on Tuesday.” But, the Hindu organisations working in the areas reuted the statement of police and claimed these persons are regular distributors of Bible and Church doles to the poor Hindus of the ares to allure them for converting into Christianity. Hindu Munnani, a right wing outfit complained to the duty doctor Usha and she alerted the police officials. “It seems the duo was promoting Christianity. We have arrested them and remanded them in jail. Further inquiry will reveal the truth,” said a senior police official of Gudiyattam division after Hindu Munnani retaliated on the matter of Church preaching entering into Govt places without any permission. A case was registered under section 447 (Punishment for criminal trespass) and 153 (A) (Promoting enmity between groups on grounds of religion and doing acts prejudicial to maintenance of harmony) in Gudiyattam town police station. It’s not a matter of a singularized matter of Vellore preaching! Christian preachers take an easy entry into all possible Govt. offices, Court and Educational Premises, Railway Stations, Bus Stops, Ferry Ghats and public places to distribute free pamphlets, Bibles, books on Christianity, flyers, pictures and many things to preach and attract about Jesus and Christianity, without any permission. In many cases it turns very objectionable when foreigners in India on touring visa are seen as engaged themselves to intervene and preach about Christianity to Indian citizen very unlawfully. 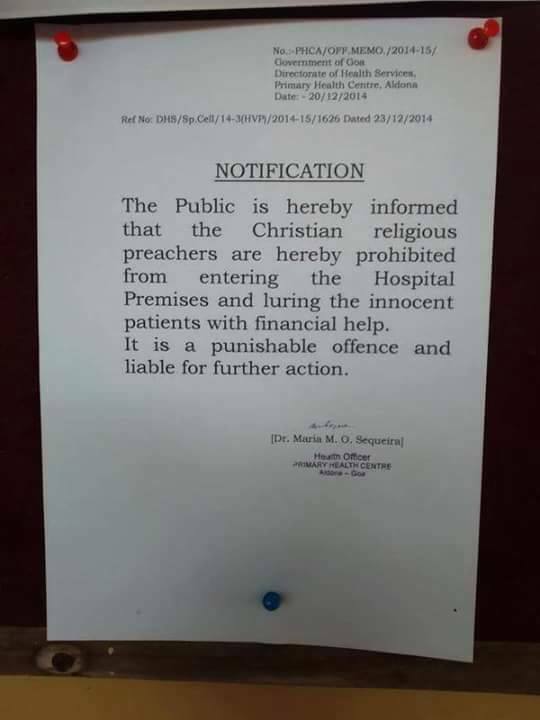 Some days back, a notice was found nailed earlier this week on the wall of the Primary Health Center (PHC) in Aldona (village in Goa, North Goa, Sub-district- Bardez, 20 km from Panaji), banning Christian preachers from entering the health centers. It was ready to serve to all PHC in Goa. But, Health authorities were later forced to `withdraw` the notice after its pictures went viral on the social media. Actually, The notice, signed by Maria M.O. Sequeira, a health officer working at the primary health center in Aldona, vide PHCA/OFF. MEMO/2014-15/ dt. 20/12/2015, approved by Ref No. DHS/ Sp.Cell/14-3(HVP)/2014-15/1626 dated. 23/12/2014, was issued to restrain Christian preachers from the said PHC from “luring the innocent patients with financial help”. Their tricks and processes are many to preach Jesus and Bible or making a broad idea that Christians are genuine and great social workers! Anybody can check for a week in Howrah or Sealdah Stations and will find some set welfare and treatment of some patients (set platform dwellers) with artificial scars -leprosy like marks, by some generous (!) and kindhearted (!!) and attractive ladies (!!!) with utmost care (!!!!) in busy prime time in the platform (!!!!!). Interesting enough, the railway authority never investigate how the fake patients came to that platform and some forefingers started their drama of treatment on platform, all on a sudden. Propagation of Religion of Christianity and Islam, religious books full of hatred or distorting others faith from Govt and Public place must be a cognizable offence. 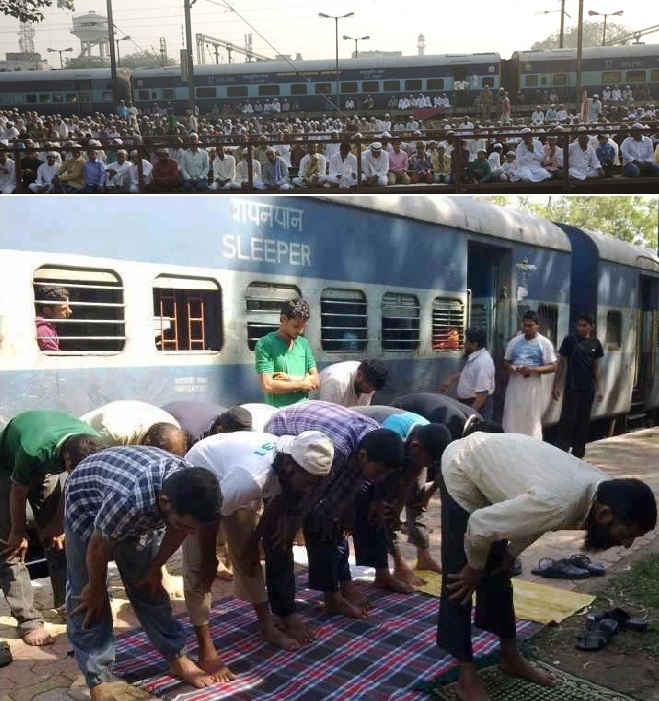 Muslims goes one-step further by offering Namaz in railway stations, Govt and other public places to show their religious might and put some psychological pressure to others. Very smartly, they assemble three or four or even individually keep away the passengers from platform or even inside the railway compartment to offer Namaz. They intentionally eat beef-stake etc. at the time of Ifftar in Ramadan inside the train compartment or waiting lounge in railway platform only to hurt the Hindu sentiments. May be the next Hindu person is completely vegetarian and does not tolerate such odd smell, but it is the power of the Muslims to Islamize all the environments, whether it is private or public! It creates a panic when the Muharram duldul and long bamboo with some decorations are being taken through the congested Howrah, Sealdah or CST railway stations after dispersing the daily passengers with brandishing swords. The Muslims come from Park Circus stn. near Sealdah, Tikiapara stn. near Howrah and Masjid stn. near CST. Strategically, they capture a station as a base of Islam just before any big terminus. [As, all these stations have CCTV arrangements, they can check the genuineness of this report]. When these Muslims go to Tabligh, they never book their ticket ticket in local trains as they think all these systems are at the service of Allah, there is no need to pay the fair of ticket in the Railway Departments under a system of Kuffr. It is said that many of Mosques inside the Indian Railways stations are actually used for many suspected purposes including armoury. In recent, Jammat-e-Islami Hind have taken the programme of free distribution of Quran in Govt offices and in public places. This organisations are also distributing free Islamic books in different languages written by some fake Shankaracharya in Govt and Govt aided schools. Their motive is to glorify Islam and to tarnish the image of Hindu Dharma. And they are promoting their design without any objection of Govt departments. Practice and Religion or right to propagate it made a fundamental rights in India. Buy, no where it is said that those rights should be inculcated through using Govt. places, system, instruments, violating the restrictions and reservations respectively. Govts. in Central, States and various Departments must not indulge into misuse of Govt place, system or instrument anyway for some communal purposes. It should be stopped immediately. What the administration is doing? Legalize Uniform Civil Code and completely ban religious coversion. Beware of Secularists, they are the agents of De-Hinduanizing Indian society. WHY HINDU TEMPLES AND HINDU ORGANISATIONS LIKE VHP, RSS, SWAMIJI’S WITH GOOD FUNDING SOURCES DONT START DISTRIBUTING :SHREEMAD BHAGVAD GEETA”? PROMOTE GNYANOPADESHA BASED RADIO CHANNELS AND TV CHANNELS COMBINED WITH DEVOTIONAL SONGS BY JAGJIT SINGH, ANUP JALOTA ETC, AND REGIONAL LANGUAGE SONGS AS THE CASE MAY BE. PROMOTE SATSANGS IN EVERY COLONY AND VILLAGES. I DONT FIND ANY TEMPLE PLAYING SUPRABHAT OR DEVOTIONAL SONGS EVEN ON AUSPICIOUS DAYS. NO DOUBT FOR EVERYTHING MONEY IS REQUIRED AND THE MUSLIM & CHRISTIAN COMMUNITIES ARE BEING FUNDED WITH ENOUGH RESOURCES. BUT AT THE SAME TIME OUT OF 80CR HINDUS IF CAN REACH UPTO 10CR PEOPLE AND COLLECT 100RS FROM EACH EVERY MONTH. IT WOULD GIVE 1000 CRORES. OR REQUEST PEOPLE TO BUY 2 BOOKS OF BHAGVAD GEETA AND ASK THEM TO GIFT 1 BOOK TO ANYONE HE MIGHT WISH TO. OPEN A WEBSITE AND ASK PEOPLE TO DONATE ONLINE FOR THIS CAUSE…AND ADVERTISE ( ASK PEOPLE TO SPONSOR ) THIS CAUSE FOR ATLEAST 1 YEAR CONTINOUSLY. EVEN A SMALL CHOCLATE, BATHROOM CLEANER, EARBUDS, COCACOLA(POISON) IS SOLD ONLY THROUGH ADVERTISEMENT….THOUGH WE CANNOT ADVERTISE ON THE BASIS OF RELIGION…WE CAN ADVERTISE ON THE BASIS OF CAUSE. This entry was posted on February 17, 2015 by hinduexistence in Breaking India by Christian, Breaking Indian National System by Muslims, Christian Conspiracy against Hindus, Christian Conversion Conspiracy, Conspiracy against Hindus, Conspiracy against India, Hindus under Christian Aggression, Hindus under Islamic Aggression, International Conspiracy against Hindus, Islamic Conspiracy against Hindus, Islamic Menace, Muslim Aggression in India and tagged Beef Eating, Bible - Quran Distribution, Goa says no ban on preachers, Muharram-Run, Offering Namaj, Opposition wants probe, Quick Sermonizing, Stop Religious Practice and Perching in Govt and other public places, Two Distribute Bibles in Government Hospital.